I LOVE this table. My dining area is only 8 x 10 and is off to one side of my kitchen. I have stainless appliances so the carries the stainless thru. I have a bench on one side and chairs on the other. If your family is small in stature you could seat six (which is how i have mine) otherwise will fit 4 very comfortably. Its a narrow table so putting folks on the end would be a tight fit. 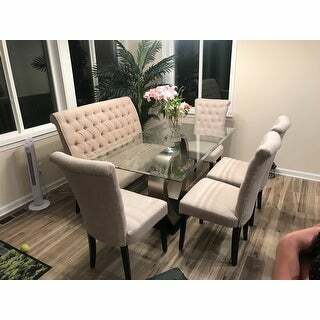 Give your dining room some elegant sophistication with this contemporary glass top dining table, which is sure to be the focal point of your space. The curved legs with a satin finish attach to a black base for an aesthetic reminiscent of modern sculpture. 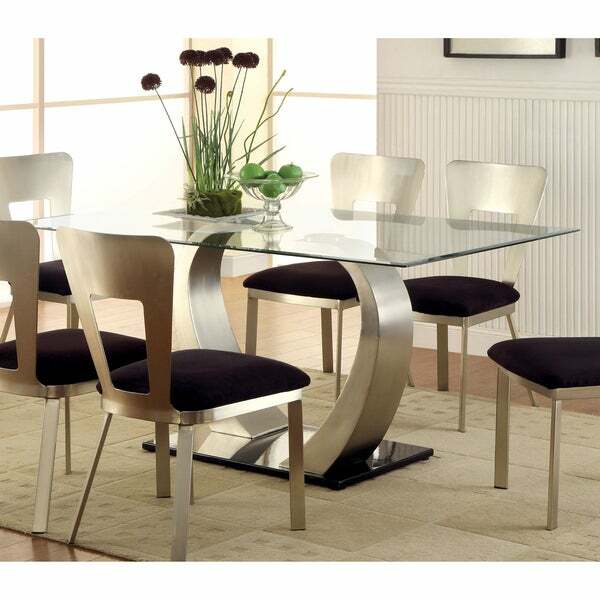 The tempered glass rectangular tabletop comfortably accommodates eight people, making it ideal for family meals and small dinner parties. Dimensions 60.0 In. X 36.0 In. X 30.0 In. I am very pleased with the quality of the table. It requires two people to assemble, but assembly was easy. It was delivered on time. I was given a "time window" and received a call 30 minutes prior to it being delivered. The outside of one of the boxes was damaged, but the pieces were so well packaged, there was no damage to the table or glass-top. I've had many compliments on the table. This table is amazing...heavy &amp; so beautiful! The glass top permanently attaches to base so there's no chance of sliding off. It did take a month from order to delivery. Looks as in photo, not difficult to assemble. Came packed to withstand just about anything. Make sure you have a strong vacuum to clean up all the little bits of styrofoam after you unpack it. Table is sturdy, glass is heavy. Clean lines. Will seat 4 comfortably, six would be a bit tighter. Smaller than a “average” dining table. Love it, bought matching pieces! Enjoy! What a beautiful table. But the best is purchasing things on Overstock and not paying any shipping. Love this site. 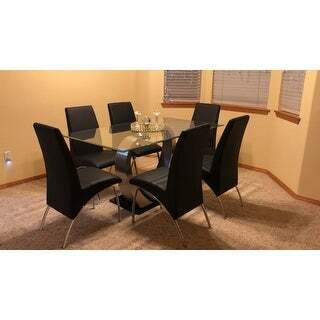 Love the look and size of this dining room set. Nice quality for the price. I love this table . It’s very elegant. It’s gives my home the look I wanted for my family. Great from dining to home work it’s a great addition to our home . Packing was up to par to avoid any damages. Was easy to assemble. All pieces were in the package. Is sturdy and seems durable. Comfortable. Sits level and has a quality look to it. Awesome piece for a decent price. I love this table. I purchased it to use as my desk, and it looks great. We get a lot of compliments. Super easy to keep clean and scratch free. Exactly as described and easy to put together. "Is the glass easy to scratch?" "Can we buy the base separately"
"Can I buy the same table smaller?" The dining table is not available in a smaller size. "How much is each chair that goes with this table?" The chairs can be found under ITEM#: 17142182. "Can we buy this with bigger glass top or without glass?" No, the two disks are permanently mounted on the glass that you attach the two legs to. I dont think you would want to put a larger piece of glass on due to the fact if you are one that puts elbows on the table-it moves. I just wished the glass was a little thicker but since i dont i do t have kids, its working just fine. "Where can I buy the chairs pictured with Item #1714-4806 ?" "Is the base a satin "silver tone" or "gold tone?" Hard to determine from the photo."